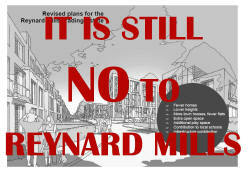 Controversial plans for a major housing complex on the Reynard Mills trading estate have been rejected by the Government. Developer LP (Brentford) wanted to build 275 flats and houses for 995 residents on the former BBC site just off Windmill Road (on the Ealing/Brentford border) with the majority to be housed in 7 & 6 storey tower blocks. Hundreds of local residents have fought a lengthy campaign against the proposals, and last year, in the face of this opposition, Hounslow Council refused permission for the scheme. The developer appealed, and, in November, a public inquiry was held at Hounslow Civic Centre with the report sent to Communities Secretary, Eric Pickles, to make the final judgement. In his report (pdf) , which has just been released, Mr Pickles accepted that there should be a residential scheme on the site but concluded that the current application would harm the area. The Secretary of State agreed with campaigners from the Windmill Road Action Group (WRAG) that the current application for the site would have been an overdevelopment. Local campaigners have welcomed the news but caution that there is yet another application currently being considered by Hounslow Council. James Guest from WRAG says they have studied the new application and believe it will have an adverse impact on the surrounding residents. ''t is a massive relief to the local community that this development won’t be going ahead.There were hundreds of objections to the plans, which we had already refused as it simply wasn’t appropriate for the site. “Yes, we do need more needed family homes in the borough, but we have planning policies in place to make sure that they compliment, not conflict with, what we already have.
'' 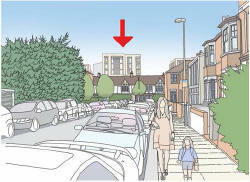 The main reason given for the refusal was overdevelopment of the site. Importantly, the Secretary of State agreed with the Planning Inspectors conclusions that re-use of the Reynards site for residential development would in principle be acceptable in policy terms. ''The Company also has a separate planning application pending for a lower density residential scheme comprising 229 units or 189,000 sq ft.
''This is still to be determined and the Company will now review this application in light of the detailed comments received from the Secretary of State.